By a wide margin (58% to 36%), Americans approve of the U.S. missile strikes against Syria in response to reports of the use of chemical weapons by Bashar al-Assad’s government. 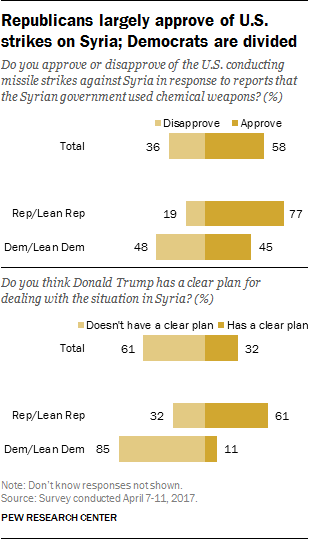 By a comparable margin (61% to 32%), the public says that Donald Trump does not have a clear plan for dealing with the situation in Syria. The latest national survey by Pew Research Center, conducted April 5-11, finds little change in public attitudes about another key aspect of U.S. policy toward Syria: 47% say the U.S. has a responsibility to accept refugees from Syria into the country, while about as many (48%) say it does not. The questions in this report were asked April 7-11, after the April 6 missile strikes, among 1,062 adults. 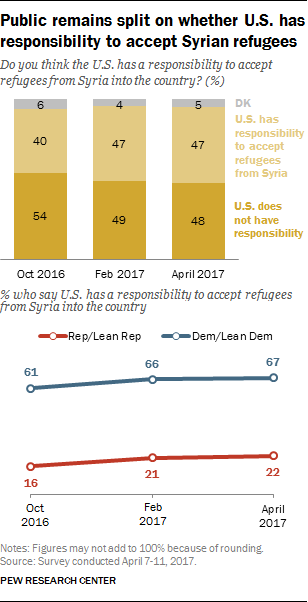 Democrats and Democratic-leaning independents (67%) are about three times as likely as Republicans and Republican leaners (22%) to say the U.S. has a responsibility to accept refugees from Syria. The U.S. missile strikes against Syria have registered widely with the public. About nine-in-ten Americans have heard a lot (61%) or a little (30%) about the attack. Republicans overwhelmingly approve of the missile strikes (77% approve). A smaller majority of Republicans (61%) think Trump has a clear plan for dealing with the situation, while 32% say he does not. Democrats are divided over the missile strikes – but a large majority says Trump lacks a clear plan for Syria. Nearly half of Democrats (45%) approve of the U.S. military action, while 48% disapprove. However, just 11% of Democrats believe Trump has a clear plan for the situation, compared with 85% who say he does not. Public opinion about whether the U.S. has a responsibility to accept Syrian refugees has not changed since February, though the share saying the U.S. has a responsibility to accept Syrian refugees is higher today (47%) than it was last October (40%). The partisan divisions on this issue remain stark. A survey in early January found that Republicans also are far more likely than Democrats to view the large number of refugees leaving Syria and Iraq as a “major threat” to the United States: 63% of Republicans expressed this view, compared with just 30% of Democrats. About half of women (52%) say the U.S. has an obligation to accept Syrian refugees, but fewer men (42%) say the same. And while a majority (63%) of adults younger than 30 believe the U.S. has such a responsibility, only about four-in-ten older adults (43%) say the U.S. has a responsibility to take in Syrian refugees. 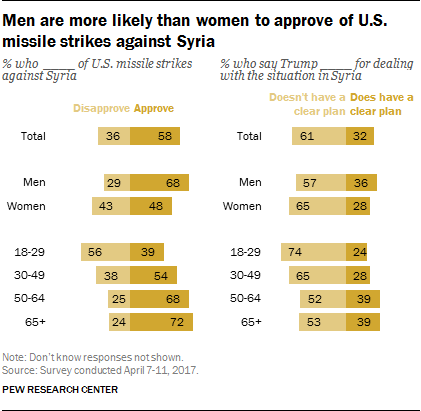 There also are sizable gender and age differences in views of the missile strikes and on whether Trump has a clear plan for addressing the Syrian situation. Nearly seven-in-ten men (68%) approve of the U.S. missile strikes in response to the reported use of chemical weapons, compared with 48% of women. And while majorities of both men and women say Trump lacks a clear plan for Syria, women are more likely to express this view (65% of women vs. 57% of men). Adults under 30 are the only age group in which more people disapprove (56%) than approve (39%) of U.S. missile strikes against Syria. Majorities in older age groups approve of the U.S. military action. Younger people (those under 50) also are more likely than those 50 and older to say that Trump does not have a clear plan for dealing with the situation in Syria. Partisans Have Starkly Different Opinions About How the World Views the U.S.